Besides the typical expansion chamber and larger cylinder kit, there are things you can do to improve the performance, safety and handling of your vintage scooter. The Sears Allstate is a stripped-down version of the Vespa VBB, a 125cc 2-stroke.The stripping down is mainly in the front fork and suspension. There is only a spring on the front fork, no damper. I have seen some “fixes” from installing a stiffer spring to fabricating brackets to add a damper. The best bet is to find a complete fork from a 60’s Vespa with an 8” wheel and replace it as a whole. It will change the scooter from a pogo stick with an engine to something comfortably rideable. Disc brake kits are available to change your front drum into something that slows down your scooter to something that stops. Like the fix for the Allstate, converting to a disc for the most part involves replacing the whole front fork with one from a newer scooter and then adding a remote master cylinder attached to the front brake cable. Many people had the idea of using a Genuine Stella front disc or complete fork, but these are not offered as a complete setup and buying the parts individually is way too expensive. The electrical system is also a place where there have been improvements. There are kits to change your 60’s and 70’s scooters to electronic ignition. It involves replacing your points ignition stator with an electronic ignition stator and CDI. The wiring harness and switches also need to be replaced. It is a fairly involved process, but if you are blowing bulbs, have a dim headlight, want to change to a non-battery system or are restoring your scooter, this is a nice option. If you have a dim head or taillight and all you do is put in a higher wattage bulb, you can run into problems. On older Vespas, the coils in the charging system are designed to put out only enough voltage to light the bulbs it came with. A higher wattage bulb will only be dimmer. But I have found a halogen bulb of the same wattage will improve the situation. Beware of the heat generated, though. I have seen melted lenses. How about a speedometer that actually works and tells the right speed? It probably won’t happen even with a restored speedometer. My fix was to attach a GPS unit to the handlebars. Another, cheaper solution is toinstall a bicycle computer; the magnet can be glued to the wheel and the sensor to the front fork. These are designed to be out in the elements and don’t need to be removed. Plus, they are smaller than a GPS. One modernization that I would love to have on my vintage scoot is fuel-injection. But it took until last week for us to see fuel-injection on the 150cc Vespas, so I am not holding my breath. Vespa has started shipping 2011 scooters, the biggest difference is that now everything 150cc and above is fuel-injected. I took a quick ride on an Orange Vespa S150 i.e. and I think it is an improvement over the carbureted version. It is smoother on startup and when riding around, but I don’t know if it is faster than the previous version. 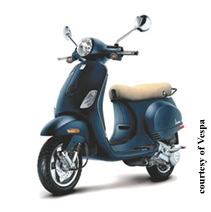 Vespa claims that it will consume 15% less fuel in the fuel-injected state.